Europeans will only be able to access mature eShop pages between 11 PM and 3 AM. Let's say, just for argument's sake, that despite doing everything short of setting up an intravenous Vitamin C drip, you've caught a bad cold. You'll be out of work for a day or two, but that's no problem: You've racked up a lot of sick time, and besides, you've got a shiny new Wii U to keep you company. Perhaps you've heard good things about ZombiU and putting on a pot of tea while it downloads seems like a good idea. Well, if you live in Europe, it's not going to happen. In an effort to shield young eyes from mature content, Nintendo of Europe has blocked anything in the eShop aimed at the 18+ crowd except during the hours between 11 PM and 3 AM. One Italian consumer noticed the issue after attempting to browse ZombiU content during the day. 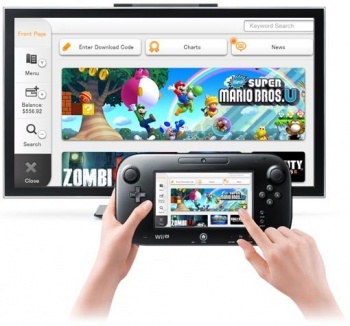 Upon reaching the game's page in the eShop, he encountered a message stating: "You cannot view this content. The times during which this content can be viewed have been restricted." At first, he assumed that he had committed an error entering his birth date or parental control settings, but a Nintendo of Europe customer service representative confirmed that the service is working as programmed. "We would like to inform you that it is an additional precaution to make sure that minors cannot access content which is inappropriate for their age," wrote the rep, explaining that the content would remain blocked for all users until the clock struck eleven. There is no one unifying law that requires Nintendo of Europe to do this, but the representative pointed out that Nintendo's interest is in keeping with European regulations about what kind of content minors can consume. "[Nintendo observes] all the relevant regulations regarding content access that are present in the various European countries," the rep explained. There is some precedent for restrictions of this nature, particularly in Germany where mature online content can also be blocked during daylight hours. The solution, of course, would be to download anything you wouldn't want your kids to see after 11 PM or before 3 AM - assuming, of course, you can set your schedule by Nintendo of Europe's timetable.